Last night I sat everybody down and forced them to watch What About Me? A documentary that promised to ".. explore the complexities of human nature from a global scale; revealing how we are all connected through our creativity and beliefs .. but most of all through our collective insanity." I adored it. The kids said it was "boring but interesting" and Dave really liked the music. I kind of fell in love with this one guy in it, said to Dave, "Hon! I understand every single thing that guy is saying!" And turned to have a discussion, but he was asleep. He also slept through the parts about a woman's sexuality - I'll have to force him to watch it again. At the end I found out the guys name was Eckhart Tolle The name was familiar - he's a German spiritual healer and bestselling author. He spent much of his life depressed and suicidal, until a spiritual transformation at the age of 29. I think the best spiritual awakenings often come from the worst pain. Today I took Max and his two mates to the park. With their overseer, Rocco, who was drunk on the power of choosing which ducks got bread. No, not you duckie! OTHER ONE DUCKIE. I'm in a virtuous habit of driving to the apple orchard at Blackheath every Sunday. It's on a real proper farm. Ten bucks a box ... you know it's winter when the Royal Galas are at their peak. I can never shake the feeling that an apple should be a summer fruit, though. Odd. I was really interested in the comments on my last post. (Blogger has promised a new commenting system very, very soon. Can't WAIT to be able to reply to comments individually.) This post "But you're doing it WRONG" by Cate Bolt and this one by Corinne are fantastic. Then the Stay at Home Babe ended up writing this (which I can't comment on because disqus broke) ... and she went ten steps further, emailing Cate herself, rallying her troops, taking up the challenge. Cool stuff is in the pipeline ... I LOVE how ideas and action can flow. Stay tuned. Lastly, my time with the Ford Territory is coming to an end. This weeks theme is Escape. Such a coincidence, as this week ... all I have wanted to do is escape! And I did. Here, I recreated it for you. That certainly is a great escape! I wouldn't watch anything scary because someone will most likely come and tap on your window and give you a heart attack! I love you Woogs, and I love you Vee. One day you will both meet and love each other. This is all well and good but you need to say it "es-car-pay" like Dory... cos otherwise I don't understand. I second the "if you don't win" sentiments. Might even tip me over the edge to straighjacket levels. Wanna watch? Glow - for you - ESCARRPPPEEE. And, pretty sure I will not win. I don't think I'm the right .... brand. Something. Heh. Escaping should be mandatory. In fact escaping implies that you are removing yourself from your life. Regular solitary days should just be a part of your life. I don't know why being around people all the time is the benchmark. I like being alone with my thoughts. It's when I learn the most. Love your escape. My escape today was 10 minutes at the library, not running after The Little Guy looking for another rescue book, just me with a coffee reading Women's Health. Gonna check out What About Me. I tried to persuade Mr C to drive to the apple farm. He said "do you know how cold it is at Blackheath right now?" No, I don't. As for the question at the end of the video - how dark do you want to go? I removed my initial recommendation because I AM A DUMBASS. OMG someone broked into your Ford & littered it everywhere. You should not park that thing on the street. Disqus is so not broken :). Not nearly as broken as Blogger's comments :P. But, no, seriously, it's not broken. So cool you went to a real orchard. I want to do that one day and pick my own apples. My neighbor once let me pick pears off of her tree with my mom. It was really neat. Everyone needs an escape now and then. Can you imagine just how insane everyone would be if no one ever got a moment to themselves? I wish we had an orchard nearby. I've been strawberry picking but never apple picking. Next time you escape, give me a call. I am coming. Just wait a day for me to get there. Oh and save me one of those apples. Grey's Anatomy is a good TV series to get glued to. I love apples. I still remember my Aunt, (who I never saw again.) making apple sauce. She took an apple and cut it horizontally, and showed me the five pointed star. I think there was a story, but that is all I can remember about it. I am lucky I remember that. My childhood is full of huge blanks. 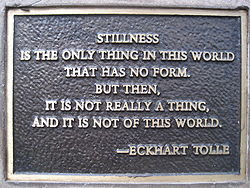 Love that quote by Eckhart Tolle, off to read all about him now and that music is cool as. Shame you have to give the car back. I LOVE Logan Brae. Every time we're anywhere near Blackheath we stop in and get juice and apple jelly and apples. I love the old guy who works there with his hat. Also so patient as I um and ah about how much I need. Also agree with Woogs, you NEED to win this comp. PS- thanks for the mention and the comment on my blog. The thing I love about blogging is it stirs up ideas in your head that may otherwise not get touched. Can't wait to hear what's happening. I just laughed out loud. Really loud - at the mess on the floor of the car. I SO know how it feels and have no idea how it gets there. You've totally inspired me to run away from home. A German by the same name was staying with me the other week, but I would certainly not describe him as a spiritual healer... Apples are best picked fresh, I have just planted myself an orchard (yay! )so in a few years when they look less like sticks and have actual fruit you can 'escape' come & eat fresh apples with me.